NECA has posted photos and details for their first ever Ultimate 1/4 Scale Figure! They’re kicking things off with Deadpool! The 18″ tall figure will be packed with new accessories and premium packaging. It’s set to be released between May and June. See details below and photos after the jump. 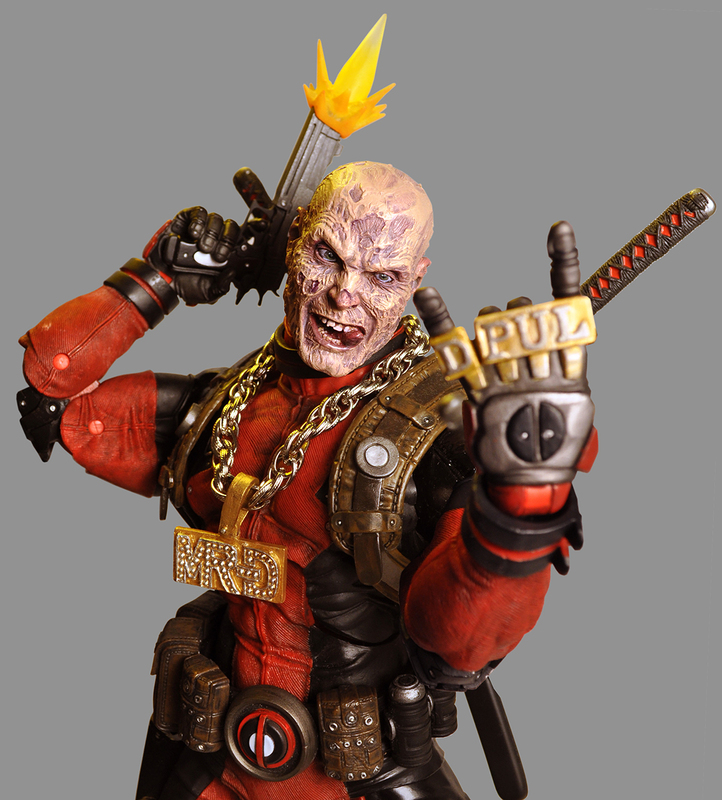 NECA just posted pictures of their 1/4 scale Deadpool with an unmasked head and a slew of other accessories. Is it a new figure or just an accessory pack? Maybe we will find out tonight at 6. If you look closely, you can see it says Ryan in the brain. I've yet to buy any of these, but this is impressive! Kinda glad I never got the other 2 releases. I will be picking this up! Me too. I am officially on board. ohhh...awesome..that i spent a hundred bucks on this mutha f^&%$a and now they are re-releasing it with "cooler" accessories and additional heads. I have absolutely no space for a two foot action figure , but dang that thing is hawesome. Although I'm not a big Deadpool fan by any stretch of the imagination, I must admit that this figure is pretty nice... 1/4 scale is just entirely too big for me to even consider purchasing. 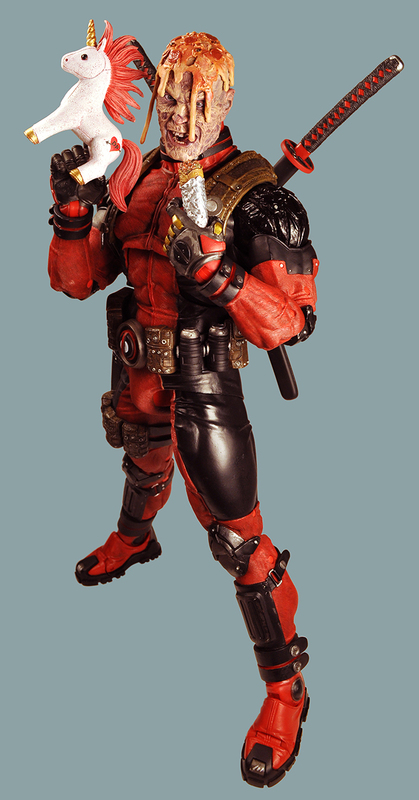 However, wouldn't it be cool with this being Deadpool, if NECA could somehow break the licensing fourth wall and make a 7in figure out of this? 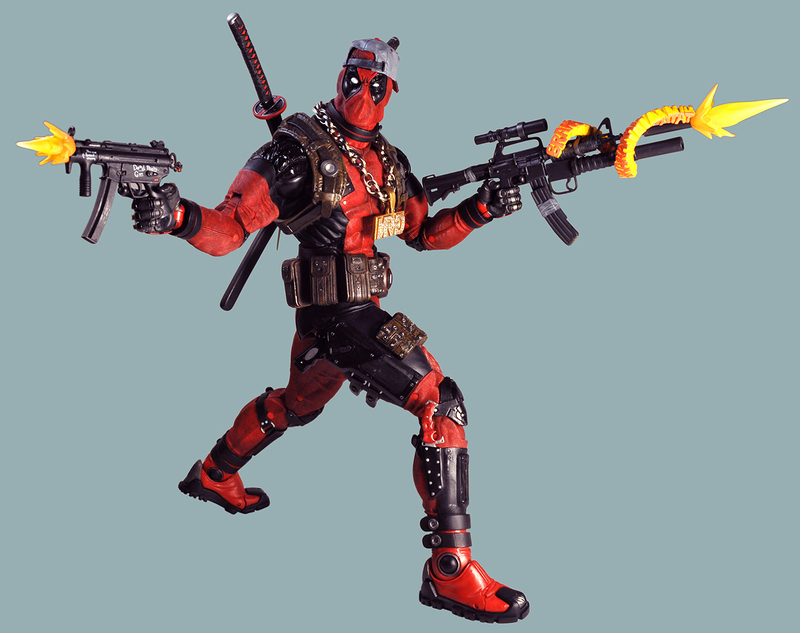 If NECA could find a loophole and make any 1/4 Marvel action figure into a 7in version, you have to admit that given the nature of Deadpool's character, that he would be the most appropriate to see shrunk down given the fact that NECA and Deadpool always break the rules and have fun while doing it. it'a actually quite an amazing figure. i actually bought it in a damaged box from Entertainment Earth for $80.00. but I NEVER have it stand alone...it's always leaning on something. pretty surprised that thing doesn't weigh twice that much. it DEFINITELY feels heavier than that.. 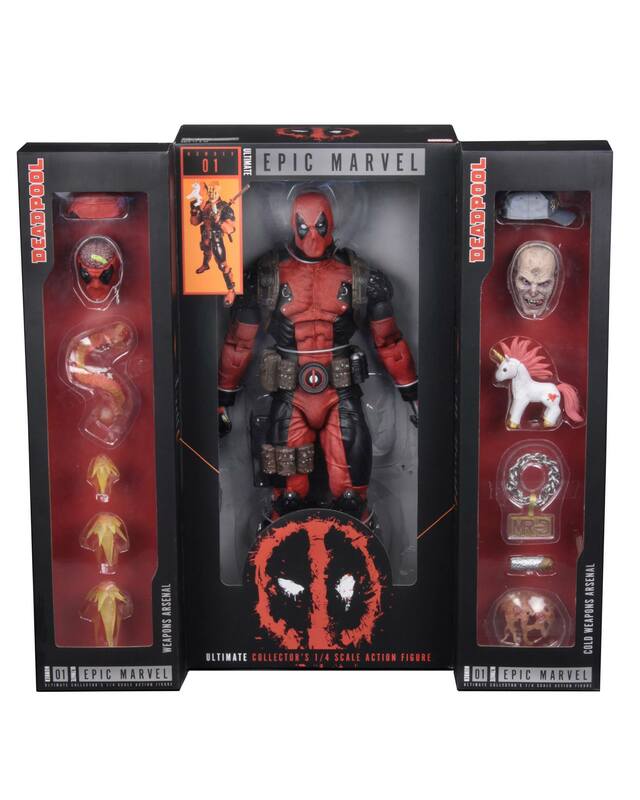 So the new Deadpool is up for order at BBTS. They already have it 20% off of the list price of $150. So according to Marvelous news it is $120. If it is already discounted and it won't be out until May I can see this price getting down to $100 like the others. Do you think these will get discounted even steeper in the future? Is it me or has NECA's output drastically slowed down as of late? I'm wondering if TRU closing has caused them more problems than we realize. Or, maybe I'm just imagining things? The thought has crossed my mind too. Randy has returned to Twitter to try and keep fans in the loop which is a good sign. My assumption would also be that the demise of TRU is forcing NECA to focus on forming replacement relationships, like how you can find their new Kratos figure at Target. Oh, I wasn't aware that they had product at Target now, but it makes sense as Target does have a small but growing section dedicated to collectors. Hopefully NECA will be able to get their stuff out into more places like that to make up for the loss of TRU. Design-wise, I think this might be even worse than Sideshow’s take on the character. Yeah, I agree...I'm just not feeling this figure. 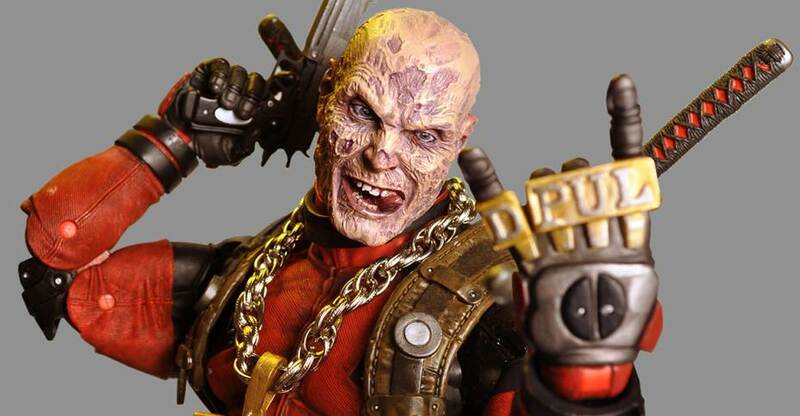 I love the recent different Marvel Legends versions that Hasbro has put out, but NECA's is just a little TOO packed with extraneous details and some of the sculpting is just ugly, especially on the unmasked head (and I'm not just saying that because Wade is disfigured). That and the dumb rapper bling just makes this an unappealing figure, design-wise. I think he looks pretty cool but I can see why the figure itself is a bit off putting. I'm just now getting into Deadpool because of the movies so I don't know I'll have to think about getting this one. Especially since he is 120 dollars. 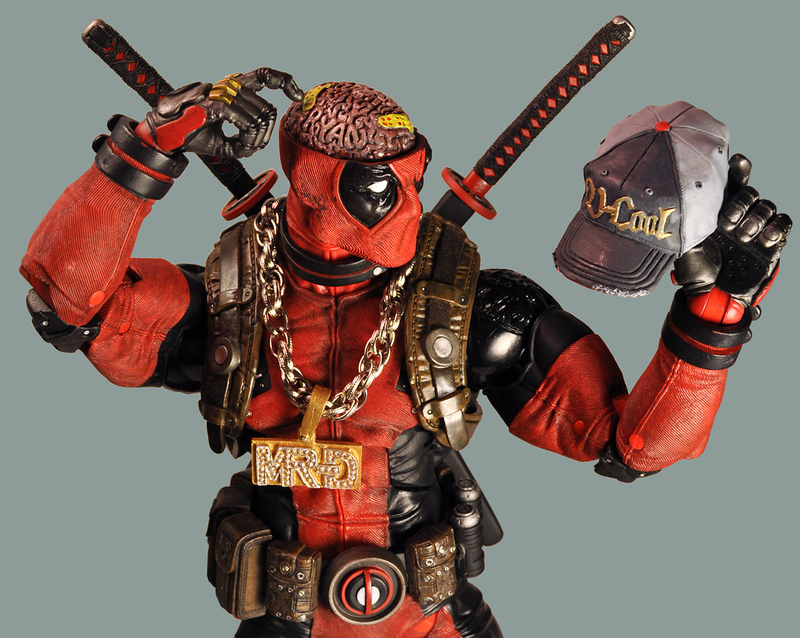 May just wait until my pre-order for the Deadpool 2 Hot Toys Deadpool comes in. En Sabah Nerd- something is definitely up with NECA. On Facebook they basically announced that all their Predator stuff has been delayed due to a combo of factory issues (which they seem to blame for everything lately) and their focus on the movie The Predator, which they said is taking priority now. However, as part of their announcement, they're not allowed to even show pics of the new movie figures until the film's release date in September, and no other new Predator figures will be released before the movie stuff. So, that means we are not getting any new Pred stuff for quite some time. Also, they mentioned that the release calendar on their website finally has been updated to be current, but if you look at it the offerings are scant and it's 95% re-releases of existing product. Clearly, TRU's demise has hurt them and they're scrambling to find solutions. Personally, I'm terrified that they're going to quietly cancel their entire AVP Arcade line, which would crush me. I hope things get better for them.